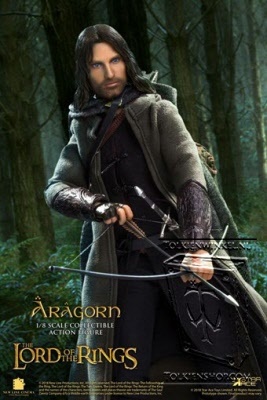 Aragorn, son of Arathorn, called Strider by the Hobbits was one of the great heroes of Middle-Earth. He helped in the quest to destroy the One Ring and led the armies of man in the battle against the dark lord Sauron. Star Ace brings Tolkien's hero to life in their new 1:8 scale Real Master Series with an authentic recreation of the character from the film The Lord of the Rings: The Two Towers. 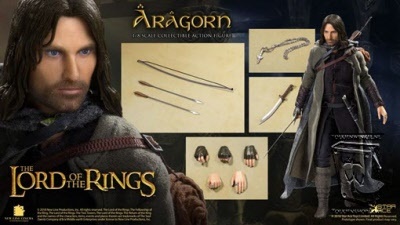 Offered in two formats, the normal version comes equipped with a sword and Elven dagger with the Deluxe Version adding a bow and arrows and a bedroll. 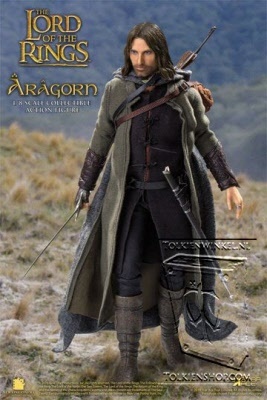 - Fully realized authentic likeness of Viggo Mortensen as Aragorn in the movie "The Lord of the Rings - The Two Towers" with accurate facial expression and detailed skin texture, each head sculpt is specially hand-painted.